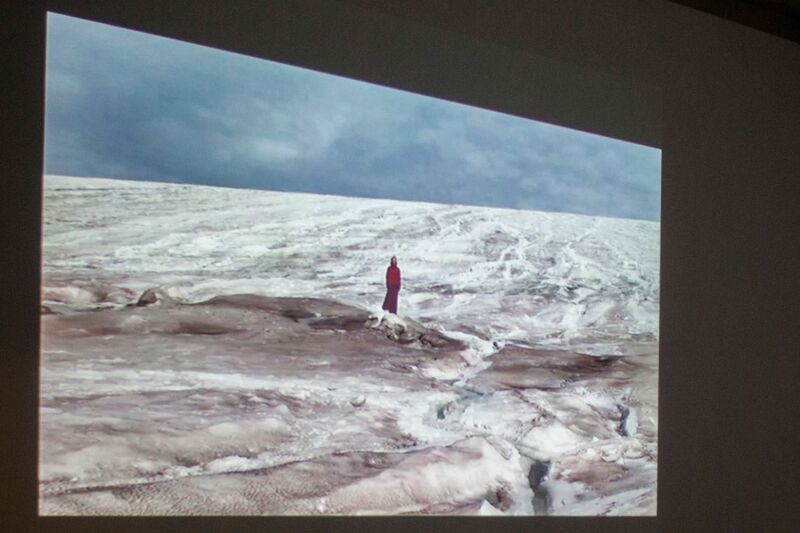 sin∞fin – Performances at the Core of the Looking-Glass (Antarctica, 2012), film. VestAndPage, exhibition view at the VENICE INTERNATIONAL PERFORMANCE ART WEEK 2012. Image © Monika Sobczak. German artist Verena Stenke and Venetian artist and writer Andrea Pagnes have been working together since 2006 as VestAndPage in site- and situation-responsive performance and video art. They research private and social spheres through fragility, transformation, vertigo, conflicts, infection, rejection and the idea of union. Their investigation leads to the essence: to reveal this vital impulse, which gives movement to the body, revealing mystery, being fruit of the knowledge of oneself and giving breath through art. Their performance-based film trilogy sin∞fin, produced in Antarctica, Patagonia, Tierra del Fuego, India and Kashmir between 2010 and 2012, combines the ephemeral art form of performance with filmmaking, and analyses artistically the subject of spheres. Installations and performances have been developed in situ, to form the three episodes of sin∞fin - an art project set between reality and vision to stimulate reflection on our common, conflictive contemporary situation. The VENICE INTERNATIONAL PERFORMANCE ART WEEK 2012 screens the trilogy's concluding episode produced in Antarctica: sin∞fin - Performances at the Core of the Looking-Glass (2012).